How do we prepare for a shift in consciousness? The idea that we need to shift human consciousness has become cliché. We’ve all heard Einstein’s declaration that problems cannot be solved by the same consciousness that created them. But just because something has become cliché… doesn’t mean it isn’t true. Many people are aware of humanity’s need for a massive shift in consciousness, but how many are thinking about what we need to do to prepare for it. What would happen if you were to suddenly experience a completely different reality? Are you prepared to embrace a shift of that magnitude? 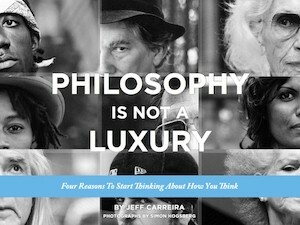 In his new book Jeff Carreira explores a philosophical perspective that can prepare us for transformative leaps in consciousness. Drawing deeply from his own experience as a spiritual explorer and his love of philosophy, Carreira introduces a perception of reality designed to stabilize us through the turbulence that exists beyond the edge of what’s possible. In this book you will experience a confluence of spiritual awakening and fearless philosophical inquiry that leaves you ready for anything. The style of the book is personal and free, taking the reader quickly through philosophical investigations that leave your mind wide open and hungry for more. By the end you will have found a new place to stand to explore the mystery of Being. So, which is it “Radical Inclusivity” or “Racial Inclusivity”? Spell check amazon’s ad copy, please. So, what’s the problem? I’d like to think the words are synonymous when it comes to the matter of inclusivity.